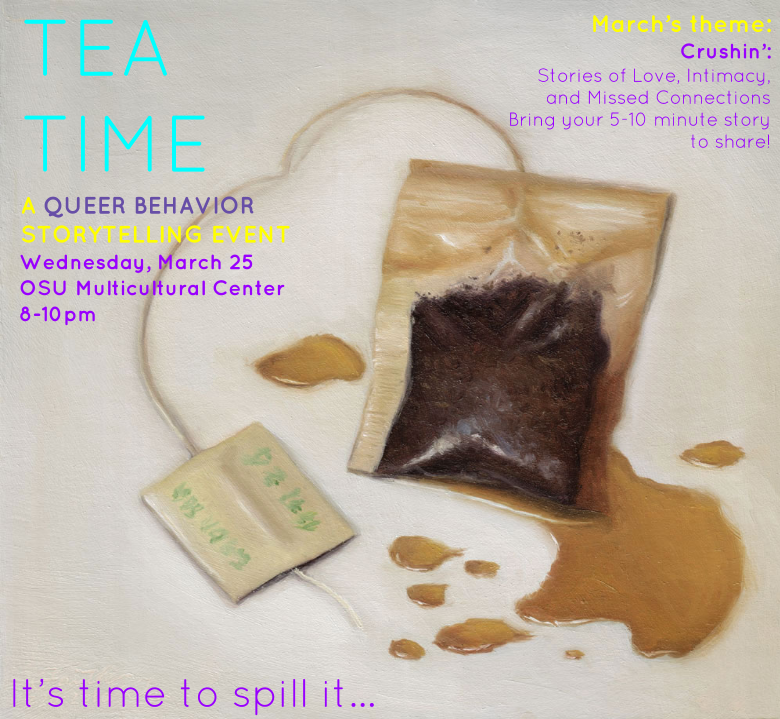 Tonight I had the pleasure of participating in an event called “Tea Time: A Queer Storytelling Event” at the OSU Multicultural Center. The theme of the event was “Crushin’: Stories of Love, Intimacy, and Missed Connections.” This was the second event in a quarterly series. The first took place back in November; I shared a piece entitled “Fragments: A Cartography of Moments on a Gender Terrain.” I love these events because I think they gives folks—particularly queer folks—the opportunity to practice having and sharing their own voices, and practice listening to the voices of others. And as I hear myself telling all of this again, I feel a little exhausted: can I do this again? How many more times can I tell these same stories to how many more people? Here we are trying in some way to get closer to each other, to build a little archive together of who we each have been. And at the same time, there are those other feelings: the feeling that this person is a whole new opportunity. I could be anyone I want to be with them. This is my chance to try different patterns of behavior, to reinvent or rediscover myself through the eyes of this person. And the other feeling of vaguely losing track of myself, because who I am with you is someone new, not entirely who I have been. That feeling of seeing you seeing me and not quite yet recognizing myself in the spaces between telling you who I have been and imagining who I might become. “What do you love to do?” I ask. “No, not necessarily what do you do for a living: what do you love to do?” Not everyone knows how to answer that question, but it’s usually the start to anything I want to know. Sometimes the word “love” gets in the way. Or sometimes we very quickly end up in a conversation about, “How do you define love?” Sometimes I ask, “What are you passionate about?” or “What brings you joy?” I’m always a little surprised when people hesitate or say that they have to think about it. No judgment, but aren’t our joys and passions and loves always right beneath the surface? Aren’t they the things that get us out of bed in the morning and get us through the hours of each day? I realize I’m asking bigger questions than other people might ask, that hesitation and needing to think about it are not so much symptoms of not having loves, passions, and joys, but probably an effect of rarely if ever having been asked to talk about them. But those are the things I want to know. Will you be able to see me beneath your projections? Will I? Are you critically aware of your own wounds, rather than repressing them to your unconscious where they continue to wreak havoc through your decision making in ways you can’t recognize or comprehend? Will I be able to approach you as an equal rather than as a patient or broken bird who I’m taking care of? Have I actually learned how to trust someone fully with who I experience myself to be rather than adjusting myself to meet their expectations in order to secure their love? So I sit there across the table from you or lying next to you, trying to get beneath surfaces—yours and my own—trying to make the most of this collision that carries so much collateral hope and attention and empathy and care, trying to figure out: what are the basic details that I need you to know, my own social surfaces necessary to orient you as to how we might proceed? Who have you been thus far, who are you now, and who do you want to become? What can each of us see or experience with each other that we couldn’t on our own? It’s like having a partial map that you’ve used before, but now your navigating a completely different city, discovering whether this old map can take you new places, and sometimes revising the map, making new marks and scribbles to try to track where you’re going now.